the bone of the upper arm, extending from shoulder to elbow, consisting of a shaft and two enlarged extremities. The proximal end has a smooth round head that articulates with the scapula to form the shoulder joint. Just below the head are two rounded processes called the greater and lesser tubercles; the area just below the tubercles is called the “surgical neck,” because of its liability to fracture. 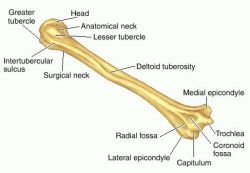 The distal end of the humerus has two articulating surfaces: the trochlea, which articulates with the ulna, and the capitulum, which articulates with the radius at the elbow. and see Appendices. Anterior view of right humerus. The long bone of the arm or forelimb, extending from the shoulder to the elbow. the bone of the upper arm, from the elbow to the shoulder joint where it articulates with the scapula. It comprises a body, a head, and two condyles. The body is almost cylindric proximally and prismatic and flattened distally and has two borders and three surfaces. The nearly hemispheric head articulates with the glenoid cavity of the scapula and has a constriction called the surgical neck, frequently the seat of a fracture. 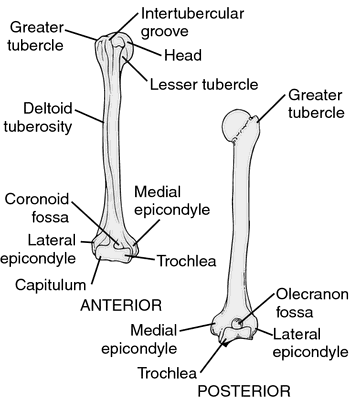 The condyles at the distal end have several features that articulate with the radius and ulna. Also called arm bone. humeral, adj. The long upper arm bone that articulates at its upper end with a shallow cup in a side process of the shoulder blade (scapula) and, at its lower end with the RADIUS and ULNA bones of the lower arm. 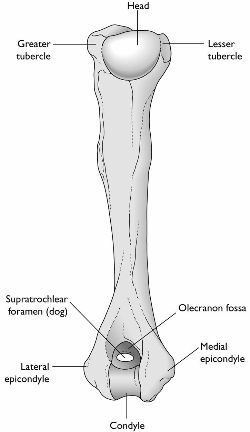 the bone of the vertebrate forelimb (or arm) nearest to the body, to which it is attached at the shoulder. It is attached distally to the RADIUS and ULNA at the elbow. The bone of the upper arm. the bone of the upper arm, articulating at the shoulder joint with the scapula, and at the elbow joint with the ulna and radius. Figure 1.
the bone of the upper forelimb, extending from shoulder to elbow. 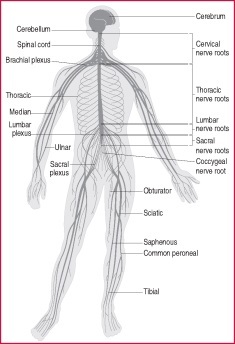 It consists of a shaft and two enlarged extremities. The proximal end has a smooth round head that articulates with the scapula to form the shoulder joint. Just below the head are two rounded processes called the greater and lesser tubercles. 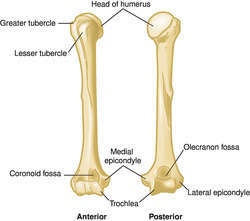 The distal end of the humerus has a trochlea, which articulates with the ulna, and a capitulum, which articulates with the radius, at the elbow. See also Table 10.